Art Gallery * Framing * Consulting The Art Store is dedicated to exhibiting 20th century and contemporary American art by leading West Virginia, regional, national and internationally recognized artists. 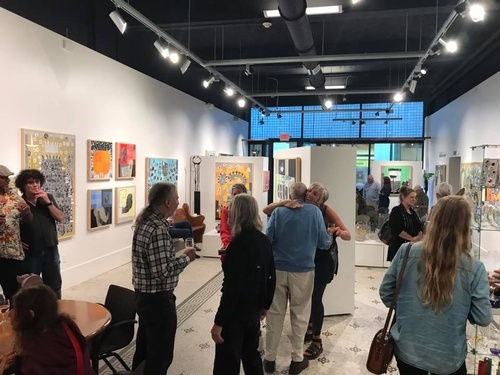 Professional integrity, commitment and vision are the criteria for artist selection, with many of our artists having an extensive history of exhibitions, awards and museum placement. All genres of painting, sculpture,diverse, series of solo, group and invitational shows are presented throughout the year at The Art Store. We frame using only acid free (museum quality, conservation and archival materials. The Art Store frames for longevity and conservation of all works. Framing is 100% guaranteed. The Art Store also offers installation, is qualified to read blueprints for art placement, is available to work with designers, architects and owners for selection of art to meet budgets, can commission art for site-specific projects and is also knowledgeable in the installation of security hardware for high-risk locations. Full service art gallery featuring local, regional, national and international artists. Custom framing using archival materials; extensive frame and mat selection. Functional Art in a variety of price points. Perfect for gift giving and to add that special touch in your home. Solo, group and invitational exhibits. From Lee St. turn right onto Hale Street, The Art Store is second building on right.